Bits and Pieces | E-verything! What do I mean by bits and pieces? Anything that I have developed and find useful that someone else might also find useful – I will also talk a little about the context in which the resource is used. So the page will be a pot pourri of files and ideas. The very first “bit and piece” is a little example poster on copyright-and-plagiarism I was teaching basic computer literacy a couple of years ago and asked students to reasearch copyright & plagiarism and then produce a simple Powerpoint poster to explain one or both of them. The students were very short on ideas of how to do this so I did a quick one to give them some ideas. I have continued to use this as an example with literacy students. For me it has the added advantage of remaking the points about copyright. This is the Twitter A clean Nest powerpoint that formed the basis for the whiteboards I used in Elluminate during the recent Edublogs Online PD session about some strategies for dealing with attacks on our Twitter accounts. My “Where in the world are you?” interactive map. This has an outline world map with some timezones marked and movable markers for participants to move to their approximate location. You will need to: Right Click and Save to download this “Where in the world are you?” interactive map because it is an Elluminate/BlackboardCollaborate whiteboard file so you won’t be able to open it except by loading it into Elluminate/BlackboardCollaborate. It is saved in that format so that the moveable markers remain moveable! I am sharing this at the request of some presenters at the Reform Symposium (July 2011) #RSCON3 however anyone who wishes is welcome to use the map under the following CreativeCommons licence. On slideshare I have uploaded a presentation “Featuring Whiteboards” on using Elluminate / Blackboard Collaborate that presentation refers to templates for preparing a whiteboard activity with moveables to reveal an image. The templates are available here for anyone to use. They are a singlePowerpoint slide GuessPicGrid with a grid and an associated whiteboard slide with moveables – you will need to: Right Click and Save to download the whiteboard file. This is because it is an Elluminate / BlackboardCollaborate whiteboard file so you won’t be able to open it except by loading it into Elluminate/BlackboardCollaborate. It is saved in that format so that the moveables remain moveable! Thank you very much for these really helpful resources, Jo! 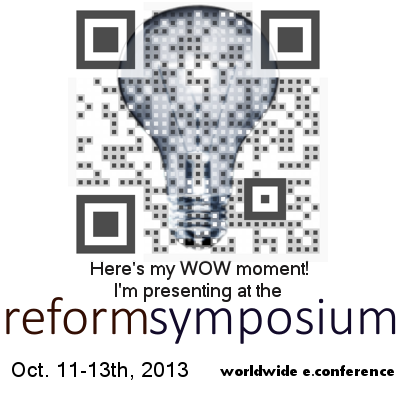 Pingback: Reform Symposium presenter training – overview | E-verything! Jo – Thanks for sharing all your wonderful resources. I am moderating this weekend, and I would like to use your World map. Yet, when I open the link, I get .html type language, not an image. Is there a special key I am missing for this resource?